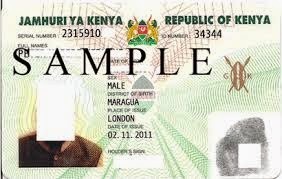 Have you lost your Kenyan Identity Card and need a replacement/duplicate? This article explains how to apply/replace a lost Kenyan ID card. A police abstract from any police station in Kenya. To get an abstract, you need to report the loss of the identity card to a police station. Nairobi City County Nairobi and Central Region Huduma GPO: Teleposta Building, Kenyatta Avenue. Inform the registration officials that you would like to replace a lost identity card. You will be directed to the appropriate queue. Present all the documents above. Fill in the application form presented to you. Your fingerprints will be taken and you will be issued with a waiting card to collect your ready ID card replacement. Replacement ID cards are now issued in about two weeks. If you don't have a passport photo, the registration officers can take a photo of you at the registration center at a cost of KES 100. You can check the status of your ID online at the website identity.go.ke though it seems to eternally suffer from downtime! You can also check the status of your application by sending the serial number of your waiting to the SMS number 20031. But take note this also doesn't always work as efficiently as it should.